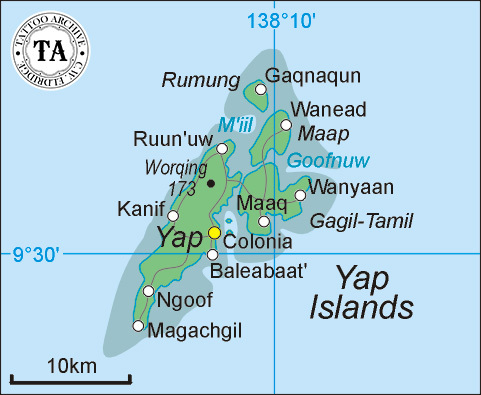 Found in the western Pacific Ocean, the Yap Islands are part of the Caroline Island group. Four islands comprise the Yap group which are joined by a common coral reef. Like much of the South Pacific, Yap has a long tattoo history. 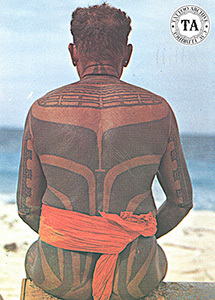 Yap islanders would cover much of their body with large bold black patterns. Historically there are three types of tattooing in the Yap Islands. Yol, covers the upper part of the body and is generally reserved for people of high rank. Zalbachag, covers the legs and is the mark of a man who is an expert fighter and Gachow is the kind of tattooing for the rest of the people. Yap tattooing is done in a traditional hammer style, using bone and shell tools.